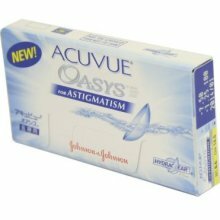 Johnson & Johnson's Oasys for Astigmatism, with HYDRACLEAR® Plus technology built in allows your eyes to stay super moist and comfortable, even in challenging environments such as working at a computer for hours or traveling on an airplane. Oasys for Astigmatism has the highest UV-A and UV-B protection. It almost feels like you're not even wearing lenses! Helps keep eyes from feeling tired and dry with a visibility tint ensuring your lenses are easy to see and handle. Each box contains 6, 1-2 week disposable soft contacts in buffered saline solution, with UV protection. 38% Water Content.